Pay 10$ for a USB “charge only” device you need to remember to bring with you, and can maybe charge at 1a . Or pay $10 for a 3a wall charger that will charge most phones to full in under 30 minutes. The USB “charge only” device wont charge your phone if it’s all your brought, the 3a wall charger will. What amazes me most, is that there are multiple of these USB prophylactic dongles on the market… of which they all simply encourage people to plug in to USB ports. It’s like saying it’s safe to eat shellfish just because you have an epinephrin pen available. why not just not take the risk if you’re allergic? – Let the two pins that carry voltage to pass through to the other connector. – Leave the other two data pins (D+, D-) unconnected. That’s it. It’s just wiring up the pins on the two connectors. No 1Amp limit. You’re completely safe, because no data can ever, ever arrive at your device, only the current. Now, there are *other* dongles that say to “protect” pen drives when they are connected to PCs. These are completely different since they allow some data to pass (so they’re vulnerable). Conclusion: these dongles do their job well. You can use them with whatever charger you like, they don’t have any current limit. Leaving the data pins disconnected reduces the maximum charge current to the original USB max of 500mA. You need to short them at the source end to get the maximum output (2.5A or 2,500mA) available from sockets meeting the newest USB charging standard (BC1.2). 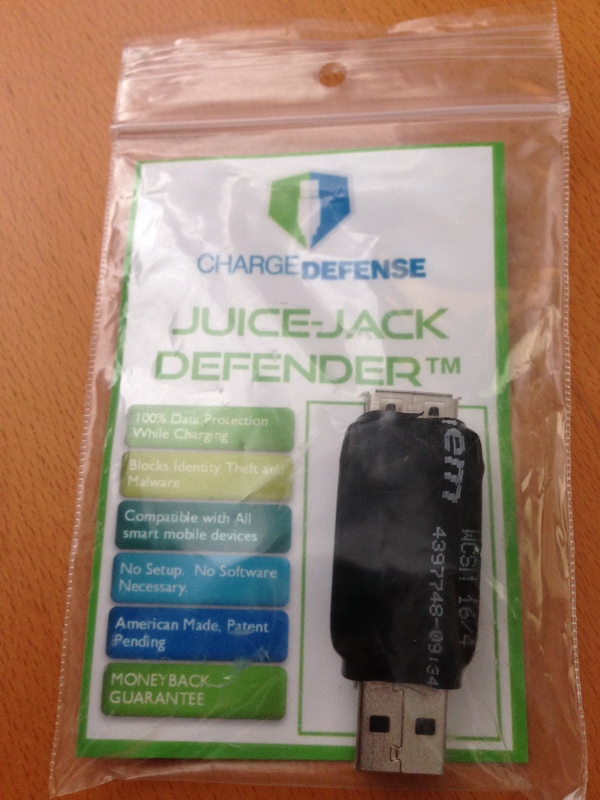 Either method will protect your device from being ‘jacked’ equally well. Maybe I’m a dope, but why don’t you use the power adapter that plugs into a wall outlet for charging? No data hijacking there, and outlets are everywhere in most waiting areas at airports and public buildings. If you travel to other countries, the power sources are varied and do not accept the same types of plugs. If you forget your adapters, (which can get quite heavy), its nice to have an option to stay secure. I carry a small portable USB charger. I can charge my phone about 2.5 times on a single charge from the enclosed battery. It has 4 LED’s to indicate “full” to “empty” – and it will completely recharge to ‘full’ in 4-5 hours. It uses the same USB cable to either charge up its internal battery or to charge my different phones (square USB plug to micro-USB adapter). For some reason, I cannot charge a blackberry with it – but android phones (various models) and windows lumia charged without issue. Are you doing anything to “tighten up” the circuit board? I’d love to see something that wasn’t 2 inches long sticking out of the side of my laptop, and it sure looks like there’d be plenty of space to trim the current board down. We’ve definitely cut down the space. That was the big difference between RevA and RevB (the one one CrowdSupply). Is there any difference between using one of these and one of those “dumb USB” cables that shorts out the data pins and allows faster charging? Because these don’t short out the data wires, fast charging methods – which utilize all four pins in the USB connector – are theoretically available. With the data pins disconnected out the charge should be limited to USB specs (500ma for USB 1.1/2.0). Not much, no. I have a standard USB cable that I modified by cutting & shorting the data lines at both ends that I use as a secure charging cable for all my gizmos, & ensures that I get the maximum charging rate. here is a cheaper and easier cheaper thing you can do if you want to make sure you don’t have to worry about your phone syncing with usb. get an uber cheap cord. Now USB only uses 4 pins 5v positive and negative for the power and then an Tx (outbound data) and Rx (inbound data). google the pin setting to make sure you get the right pins. now take a knife and scrape off the 2 metal contacts in the USB plug for the Rx and Tx. there problem fixed and the only thing going through the usb cable is power and 0 data since the data lines are not connected at all. that is all these condoms actually do and they charge way more than they are worth for them. 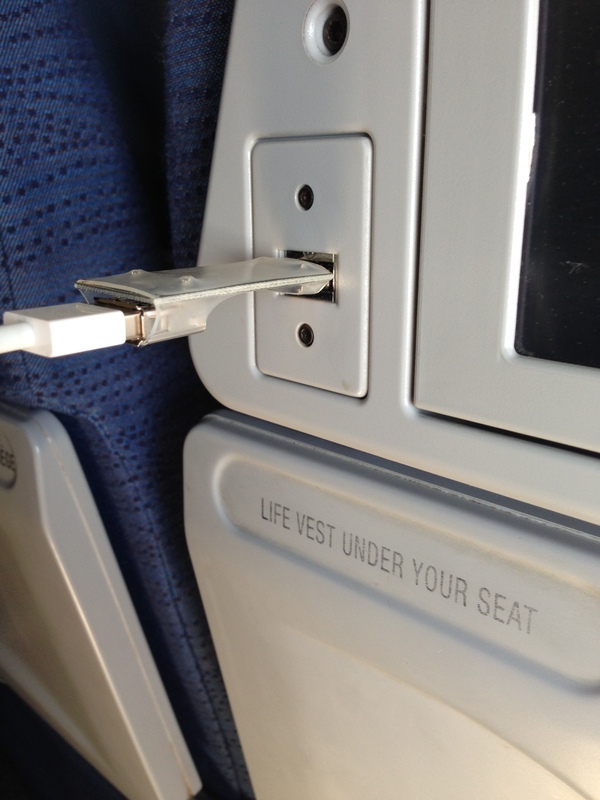 As I mentioned earlier in the thread and have explained probably thousands of times since I created the USB Condom…we did exactly that for years. But you’ll find that doing that wont work for IOS devices. Apple devices NEED the data pins just to “OK” the power pins. Apple did this to force you to buy “Apple compliant” USB cables. Furthermore if you read back through the thread here on this blogpost, you’ll also see that we also got tired of cannibalizing good USB cables in the name of security. 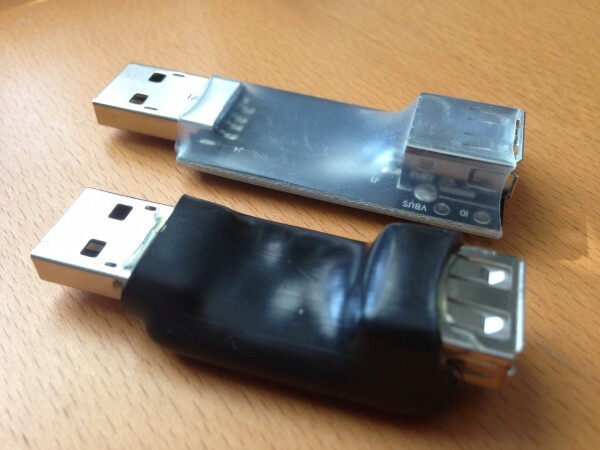 With a USBCondom you can “clip the pins” without destroying a perfectly good cable. Leave it on to be safe and take it off when you’re ready to sync. Cutting cable nearly complete solution. You have to short across the two data cables (middle two on USB), which tells your iPhone that you’re connected to a 3A power-only adapter, and will recharge quickly. In desperation once, I accomplished that with a bit of chewing gum foil (short) and transparent tape (to block pins from PC), and it worked great. Now, I don’t _know_ that that keeps the device safe, but it’s a reasonable assumption that, if your phone thinks you’re connected to a power-only adapter, and you’ve shorted the data cables, that you’re not going to sync data. I bought myself a SKIVA portable charger that I keep on me for situations when I MUST charge my phone. That keeps me from having to charge via any unreliable source. I blogged about it just the other day. FYI. iOS7 asks for permission to trust the device you connect your iDevice to. If you don’t explicitly declare you trust the device, the only thing going through the cable is electricity. No data. I don’t have any iPhone to test, but I’m pretty sure there’s always some data going through the cable even if you don’t trust the host. At least the handshake is done. If you want to be 1000% sure, “dongles” like this are the way to go, since they disconnect the cables that carry data. iOS 6 won’t allow a USB data transfer unless the user has logged into the device. For example, if you connect an iOS device to a computer running iTunes, you’ll find that iTunes will not allow any data transfer until you log into your iOS device. The problem is figuring out what time frame and login situation iOS 6 judges as acceptable or not. I haven’t been able to figure it out except to say that, as Brian points out, the ideal situation is to shut down you iOS device before you charge it. That always locks up any data transfer while allowing charging to occur. And the problem with that situation is wetware error whereby the user forgets to shut down their device before plugging it into the potentially dangerous USB connection. Clearly, upgrade to iOS 7 if possible on your iOS devices for superior security. I wonder if some regular guy can use Beaglebone to make a home juicing kit to find out what the heck his sneaky wife is up to. I use the Powerocks (www.PowerocksUSA.com) line of mobile battery packs. I can keep the phone+powerpack in my lap, and the powerpack to outlet, and powerpack to iPhone, connections don’t exchange data. A $70 pack can charge an iPhone about 5 times. MyKey Technology has a cable designed to do this. Unlike the USB keys, it works on all phones even the iPhone. It’s been around for a couple of years now. They are the guys who have a patent on USB write blocking. Great company and product. If your mobile device is encrypted and you use passwords to access your device, is your data still at risk of being stolen at one of these charging stations? Unless you use one of these things, your phone will always interact with whatever you connect it to, even if it’s just to say “hello”. Your phone will deny all attempts of the computer to access files, but there’s a risk there might be an undiscovered bug that allows the computer to bypass the restriction without knowing the password. So if you want to be 100% sure, you can use these dongles. just use a battery pack, and if it’s an unknown charging port, use the battery pack as a proxy. many decent brands allow you to charge the battery at the same time run it to your phone. it’s really that simple, you don’t need this ‘invention’ of an excess clutter. spend that 10 bucks on top whatever it costs to get a good battery or two. Wow. What a bunch of clueless blather mixed in with what would be an otherwise logical discussion focused on keeping one of today’s most vulnerable devices safe into which we place our most trusted stuff. A device so powerful, the US Supreme Court just ruled the authorities can’t poke about in it without probable cause and warrant. Complete Tx/Rx disconnect is the ONLY way to guarantee protection. 1) For the slimmest, lightest mobile devices ever, instead of a Tx/RX blocked cable or dongle, always lug a battery pack of equal or greater mass, too. Sure. 2) That battery pack? There’s NO WAY it carries a malicious payload. Especially the ones rolling off Chinese assembly lines. 110% clean. Trust me on this. 3) Carry only a clunky hi-amp wall wart. Yup. ‘Cause there’s *always* a universal AC outlet within arms reach. 4) Always carry a Tx/Rx blocked cable. ‘Cause you’ll NEVER need to transfer data. 5) Block Tx/Rx and no more smart-fast charging? Gasp. How will we survive? First zombies; now this! 6) What?! Apple wants everyone locked into their stuff? Since when? Who knew? Who do they think they are? Google? Someone should do something!! •I carry a tiny 0.5a wall wart, a six foot standard cable (for trusted data needs) and the dongle, all of 5 ounces which fit into a 3″ x 2″ elastic sack; that does it for 99.9% of my home continent. For outback excursions, I have an “imported” 5A pack designed with foreign AC plugs and a 1A “cigarette lighter” plug, both of which I use… with the dongle. Cheers! Very insightful article. I have never fell victim to juice jacking, but who knows? It might happen to anyone at any time, so better be safe than say goodbye to my data privacy!